Links to resources below are meant to be of help should you not find what you're looking for here on All About Slots. The resource we've listed are sites we believe to be trusted and reputable resources, however as they're resource sites similar to All About Slots we cannot completely vouch for them so please use your own discretion when browsing the below listed. 777 Online Slots - A guide that features slots reviews, news, articles, casino reviews and more. Wiki Slot Machine Resource - The wikipedia resource on and about slot machine gambling. Casino Advisor Slots Guide - This section on CasinoAdvisor a reputable gambling portal offers some of the most detailed slots games reviews we've seen online. They also feature casino reviews, slots news, articles, tips and other helpful info. All Online Slots - This site features reviews of many online slots games, news, articles and other slots info. Simple but Fun Slots - A selection of slots games that can be played for fun. Simple games but with no way of saving player data. Java Applet Free Slots - These are the best Java applet free slots games I think we've ever come across online they're fun and there's many to choose from and play. 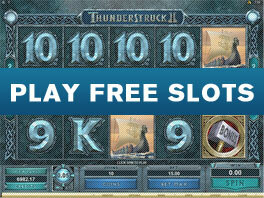 Several Free Video Slots - Although we've featured an extensive selection of free slots here at All About Slots we've found this great resource for free slots games we beleive is worthy of checking out. Gamblers Anonymous - Problem gambling help for those from the United States. Responsible Gambling Council - Problem gambling help for those from Canada or the United States. Ontario Problem Gambling Helpline - If you're from Ontario and looking for problem gambling help we suggest visiting this resource. Problem Gambling Australia - Problem gambling help for those from Australia. GamCare Problem Gambling Help - Problem gambling help for those from the United Kingdom. If you have a slots resource that you'd like to suggest we add here to All About Slots we'd be happy to evaluate it and may consider adding it. To submit such a resource please click here to visit our contact us section and submit a message via our form.